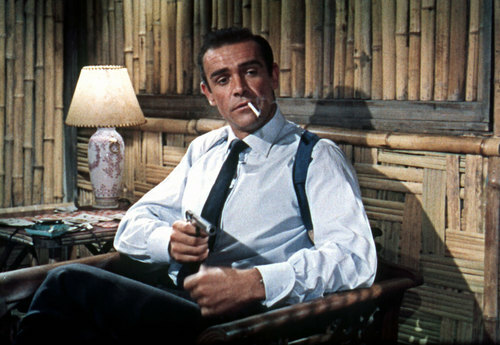 Oct. 5 marks the 50th anniversary of Dr. No opening in London, so it’s been designated as Global James Bond Day. MoMA launches a 22-film retrospective all month with new 35mm prints; the Academy of Motion Picture Arts and Sciences will honor Bond’s music, hosted by Jon Burlingame, author of The Music of James Bond (Oxford University Press); and a new documentary will be released about Bond producers Albert Broccoli and Harry Saltzman and Ian Fleming: Everything or Nothing: The Untold Story of 007, directed by Stevan Riley from from MGM, Columbia Pictures, Passion Pictures, and Red Box Films. In addition, Christie’s in London is organizing “50 Years of James Bond The Auction”: a unique opportunity to acquire a piece of Bond memorabilia direct from the archives of EON Productions as well as donations from the Bond cast. Forty lots will be offered at an online-only auction from Sept. 28th to Oct. 8, with 10 further lots to highlight an invitation-only auction at Christie’s. There is also global survey to discover the favorite Bond film by country; and an exhibition, “Designing 007: 50 Years of Bond Style,” at TIFF in Toronto. Leading up to Global James Bond Day, for the first time ever fans can own all 22 films on Blu-ray in one comprehensive collection with Bond 50, releasing worldwide Sept. 24. Further updates will be announced on 007.com. Speaking of books, there’s alsoThe James Bond Archives, a lavish volume from Taschen (edited by Paul Duncan), available in October and a must for every Bond fan. 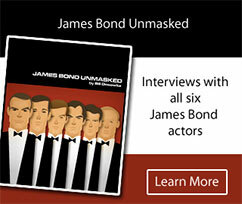 Meanwhile, my James Bond Unmasked chronicles the evolution of 007, featuring interviews with all six Bond actors.